It’s Easier To Promote Someone Else! 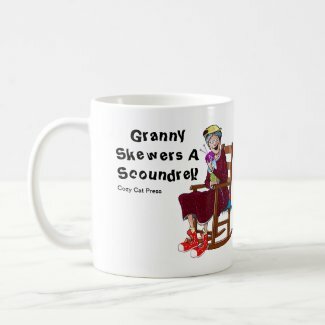 It is time to start promoting my new book Granny Skewers A Scoundrel while still promoting my first book in the Fuchsia, Minnesota Series, Granny Hooks A Crook. It is possible that if you ask any writer they might tell you that promoting themselves is the hardest part of having a book published. I am a new author so I might be too self conscious about this. Maybe it gets easier as the years go on. As for me, I like to engage with my readers but I feel funny always talking about me and my books. Here I am again doing just that. I love to promote causes and people that I believe in. It is easy for me to sing someone’s praises. It is easy for me to get the word out about an event or a cause for someone or something. Recently I was involved with a Food Shelf Fundraiser. I loved visiting the radio station and having a conversation on air about the need for donations in my rural area. Hunger in rural areas is hidden and we may fool ourselves into thinking it doesn’t exist because poverty seems to be more hidden in rural areas. It is easy to promote my friend that has started a photography group. It is easy to promote the other authors for Cozy Cat Press. It is easy for me to write my newspaper articles about people that fit silently in the background making a difference in people’s lives. It may surprise people for me to tell you that it is hard for me to promote myself and I hear that from my writer friends too. They want to write and they don’t like to talk about themselves. Writers promote themselves because it is part of the business. Because I write a weekly column and I have this blog and I have my author Facebook page called Sprinkled Notes, I feel I am yakking about myself all the time. I get tired of it and I am sure my friends do too. It is hard to find the balance to promote books, because as writers we are the creativity in that book so that means we must be front and center too. We also do that as grown ups when we see someone in the media all the time, voicing their opinion or hawking their wares or leading a community. We might not hear the words, “They’re so stuck up.” We might hear the words, “Oh, they think they are better than everyone else.” We make that judgment if someone is in the limelight or in a leadership position. We make that judgment if someone has more money than us or appears to have more money than us. We can’t know that it may be hard for them to be where they are. They may have to do the things they do for their job or their families or for whatever reason we do not know. If we feel challenged, jealous, uncomfortable with what the person is doing, we may judge. What does that have to do with writers and authors? I write a column every week for the Albert Lea Tribune called Something About Nothing. I have been writing this column for seven years. Every week when I sit down at my computer to put words to paper I wonder what I can say that I haven’t said in the seven years. There is a feeling inside of me that my readers must be tired of reading what I must repeat over the years. I feel they must be tired of those words. Having said that, people read my column. That voice inside of me that whispers those words of reader tiredness, may be more about me being tired of me writing about me. So the thought goes that if I am tired of me writing about me, what must they feel like. I don’t know if other columnists feel the same way. As an author, we have to sell books. Our publishing company promotes us but we also have to promote ourselves. That means we write and talk about our writing so we can get the word out about our books. We try to find creative ways to do this by going on blog tours, having book signings, being a guest on radio shows, handing out business cards, visiting bookstores and encouraging our friends to promote us. That promotion is our survival much the same way as someone has a 9 – 5 job and does what they have to do to keep that job. We want our publishing company to keep publishing our books. In reality, most writers want to spend their time writing, at least that is my perception from the ones I know. I’d like to hear from other writers on this and even readers. So, if you are tired of me, talking about me, I understand, I am too. It isn’t because I think I am better than you or that I think too highly of myself. It is because I am now trying to eke out a living in a tough market and to do that I have to promote me and my craft. It is what it is. Even dream jobs have their downside. My books, Granny Hooks A Crook, Granny Skewers A Scoundrel and Whatchamacallit? Thingamajig? are out there for a little fun and mystery. There are links at the side of this page if you are interested in purchasing. By the way, I make mistakes in my writing when it comes to blogs etc. I have an editor that makes me look good in the paper and in my books, so if my page isn’t perfect it is like me, not better, not smarter than those who read this blog. Tags: Albert Lea Tribune, amazon, Cozy Cat Press, Fuchsia, Granny Hooks A Crook, Granny Skewers A Scoundrel, Something About Nothing, Whatchamacallit? Thingamajig? Previous Granny’s (Hermiony Vidalia Criony Fiddlestat) At It Again! Next A Barking Cat? Men in Shorts? Spring is Here.